I have to admit to being a smart phone junky and I’m deeply embarrassed as to how many I own. That aside, over the years I’ve developed a resistance to the growing assumptions of these companies that in order to use their products I must give up so much privacy and allow them to monitor so much of what I do. I’ve never cared for Apple, considering them far too restrictive. Sure they make a product that the masses find comfortable to use, but for myself, I don’t need that kind of patronising manner- “we know you’re an idiot so we’ve made this product idiot proof”. That aside, they do make a good product and the company, aside from being extremely politically liberal in outlook, is very innovative. I favoured Samsung for a long time, but found they became a bit grasshopper like in their product range, which changed so frequently it is almost impossible to get backup on products not really that old. And they use the Android system, and as I have become to really dislike Google, this is a major downer for me. In fact Google/ Android is the reason I eventually moved to a Windows phone. My computers are Google free and I want my phone to be the same. I now have a Nokia Lumia 1520 which impresses me with its functionality and its rock solid operation. However you’re still stuck with having a Microsoft account and the consequent invasion of privacy. What I want is a smartphone without the surveillance and the tracking and the privacy invasions. At long last, the first Ubuntu phone is coming to market. 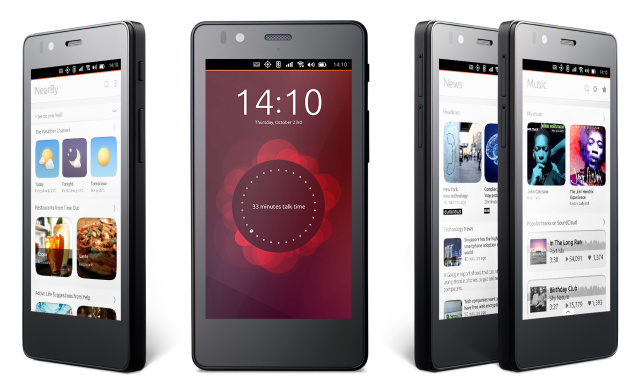 Over the next few weeks, the Aquaris E4.5 Ubuntu Edition will be available in Europe, priced at €170. Its not going on sale in the US so its hard to say when it might get to NZ. The Aquaris E4.5 Ubuntu Edition has a 4.5-inch 960×540 display, a Mediatek SoC (quad-core 1.3GHz Cortex A7 CPU, unknown GPU), 1GB of RAM, and 8GB of on-board NAND storage. Storage is expandable through a microSD slot, and it has two SIM card slots. Its actually a pretty cheap phone and I’d like to see a more upmarket version with a bigger screen, but at least the option is there and I’m thinking it won’t be long till a better version is available and I can ditch the big brother Windows and or Samsung options for ever. Freedom..!! !